In Hear This, The A.V. Club writers sing the praises of songs they know well. This week, we’re picking songs from 2016 that we discovered too late in the year to include on our year-end ballots. Thus concludes “Okkervil River R.I.P.,” the opening salvo on Okkervil River’s 2016 release, Away. It’s a track that simultaneously serves as both the death rattle and rebirth of Will Sheff’s constantly evolving yet always familiar brand of indie rock. It’s odd that “Okkervil River R.I.P.,” and Away in general, was as overlooked as it was, seeing as how it links so strongly to the band’s earlier work. The track begins with lazily strummed guitars and a vocal melody harkening back to “John Allyn Smith Sails,” the last song on the band’s critical zenith, The Stage Names. 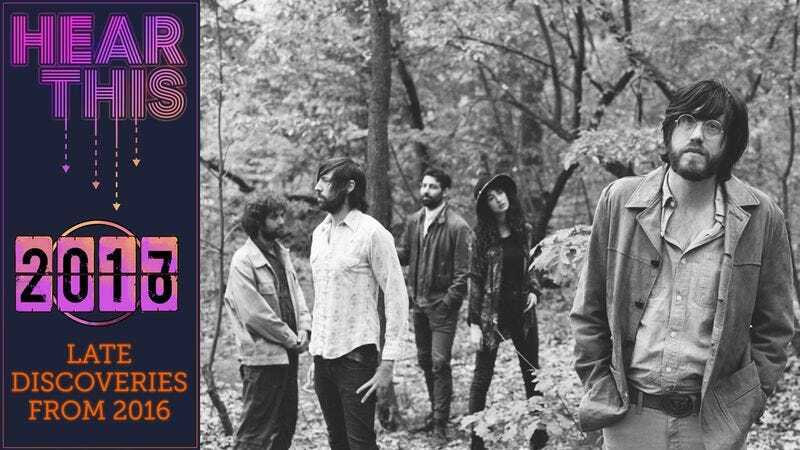 But whereas “John Allyn Smith Sails” concerned itself with the suicide of famed poet John Berryman, the nearly seven-minute-long “Okkervil River R.I.P.” is a nostalgic—and depressing—look back at the singer’s relationship with music and his band. Well, depressing if you consider Sheff bringing up the deaths of three of the Force MDs, Judee Sill, and his grandfather within the span of a minute depressing. The melancholy nature of the song reaches a somewhat hopeful crescendo in the final chorus as Sheff finds himself alone at a skating rink having given up on music only to hear the distant hum of a Kurzweil. The moment leads Sheff to once again seek out what he’d abandoned, as he creaks out the meekest of requests: “And I said, ‘Play that cover’ / I said, ‘Play that cover song again.’” A sentiment that those who missed out on Away last year may find themselves echoing in 2017.